I can't seem to stop playing with this Poppy stamp! This is almost a complete case of Tami Hartley's card. I just changed the colors of the flowers, trying to make them look like true California poppies. The text background is digital, an excerpt from The Secret Garden, from Lucy. Just as Tami did, I stamped the poppies in VersaMark over the printed text, and then used Distress inks to color in the images. The simple message is popped above the surface. Hero Arts is announcing a new class of Hostesses this week! 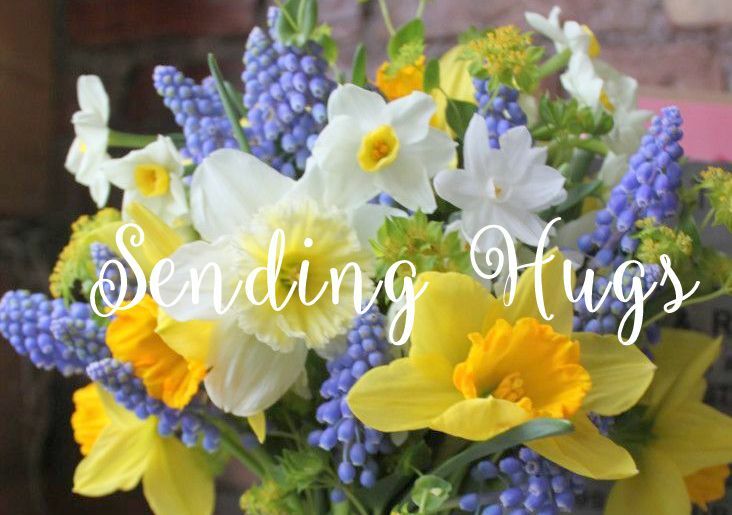 They are Suzanne Czozek, Jill Foster, Sue McRae, Vera Rhuhay, Linda Meteer, and Arlene McClung! 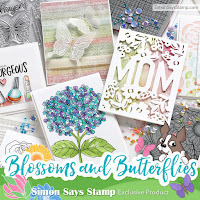 I am so pleased to see this new group; each one of them is a talented cardmaker and better than that, so supportive of our Flickr group. I made this card to celebrate their debut! Welcome to the Order of the Apron! 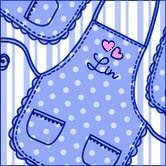 The colors and design are based roughly on my new Valentine blog background from Shabby Blogs called Lydia's Apron. Rather a coincidental name, since all the Hostesses receive a virtual apron to wear during their term. Still playing with this beautiful Poppy Background stamp. Again, it is clear stamped and white embossed over a polished stone background that was made with blues and purples. Then I went back in with markers to color the stems, pods, and add some more shading to the flowers. I was astounded to find out that there actually are blue poppies! They come from the Himalayas. I found this beautiful red swirly printed paper at the little scrapbook shop here in Florida, and since it's considered a Christmas paper, I got it at half-price! I love these swirls along the edges, and thought it would make a rich Valentine card. Hopefully you can see some of the details in this picture. Entering this in Caardvarks Red Heart challenge. I was so taken with Godelieve's cards using the new lace background stamp on vellum that I decided to try it with the stamps I have. 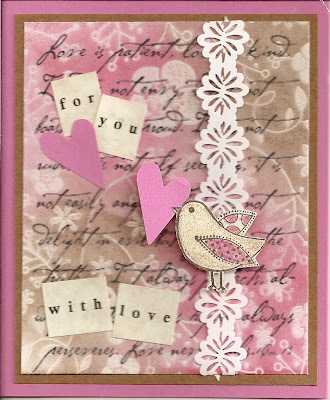 For this first one, I used the new cling Heart Flourish as my "lace", stamped on a pale pink vellum and embossed in white. This same heart flourish design is on the new blush print flowers! And on this one, my choice for the lace was Flower Wallpaper. 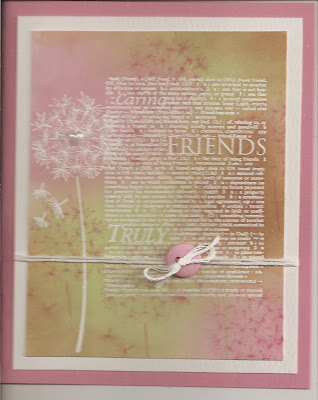 That was stamped on white vellum, heat embossed with white, and then put over the same pearly pink cardstock base. 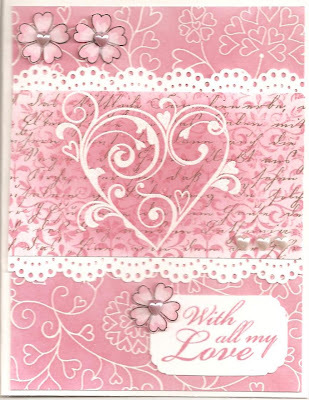 My added flowers, also made of hearts, were stamped on white vellum and heat embossed in white, adding a pink button to each and securing them together with white embroidery floss tied in bows, then popped above the surface of the card. Another entry for Caardvark's Red Heart challenge. 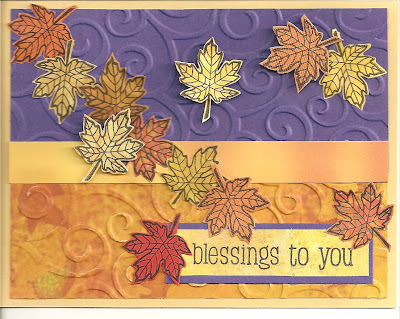 Here are 2 cards made by cutting out a shape in the front of the card, then using an embossing folder to give it texture. And on this one, I turned the lime notecard inside out and used a scalloped circle nestie to cut my window and the green frame around it. I'm entering these into Virginia's Winter Blah's contest, since they are hinting at the Spring season to come. This card started with a piece of polished stone paper that I brought with me from home. Basically you start with white glossy paper, and pounce a mixture of reinkers, glycerin and alcohol onto it. It gives a marblized appearance as the alcohol dries out. I think this was only 1 ink, a pink. I stamped the Silhouette Bells over it in VersaMark ink and heat embossed it in white, then I trimmed it, framed it in white and a raspberry gingham paper, and centered that onto my white notecard. The leaves and stems are colored in with green marker. Then just added the sentiment. For the Caardvark's Red Heart challenge. 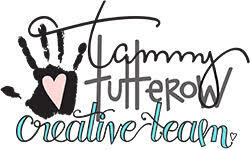 I really like the blog background I found at The Cutest Blog on the Block, called My Scroll. That is the inspiration for this card. Thanks, Vicky, this is ingenious! This one uses Worn Lipstick and the Stripes cling stamp again, only I added Shabby Shutters and stamped it a second time to make a pink and green plaid for the background. Then I added 3 of the small Blossoms cling flowers and a sentiment to it. 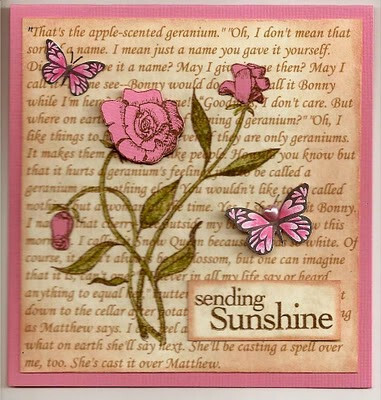 Still playing with my new Heart Flourish stamp. And since Friendship and Valentines is the current Hero Arts Challenge this month, I decided to do double duty and make more cards for my favorite holiday. 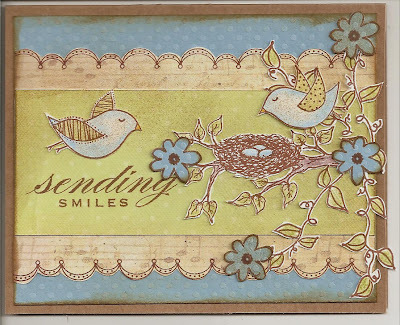 Lisa's card from the Blog Hop was one of my favorites that day. Here is my version of it. 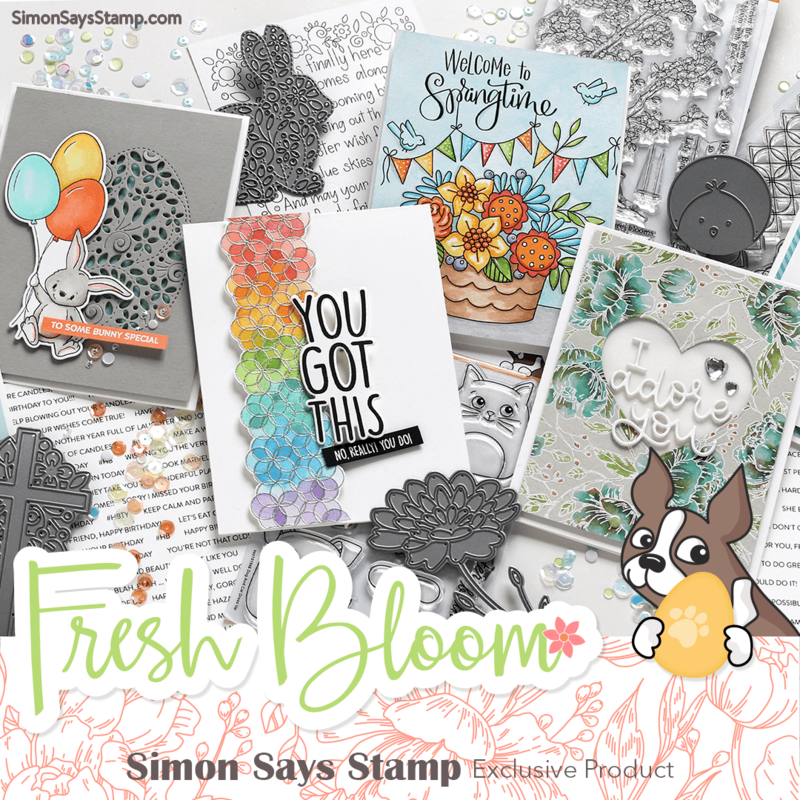 Supplies: CG169 Heart Flourish, CL272 All Occasions Messages, BoBunny Flamingo double dot cardstock, white, kraft, and black cardstock, Versafine Onyx Black ink, clear embossing powder, Prismacolor pencils, felt heart buttons, twine. I've been doing so many pink cards, decided I ought to do a few red ones. This started with a computer-generated excerpt from The Secret Garden, overstamped with the Heart Flourish, heat embossed, then colored in with Prismacolor pencils. Then I addded the large heart, small heart flowers, the sentiment and a row of red pearls. Good evening, ladies! I'm in a chocolate mood tonight, and thought I'd share this recipe just before I go make it. It really is this easy and turns out nice and rich, especially when you have added your favorite additions. Many thanks to Carol Beck for this recipe. Why is this the most dangerous cake recipe? Because you are only 5 minutes away from chocolate cake at any time of the day or night!! Add dry ingredients to small bowl and mix well, then add the egg and mix thoroughly. Pour in the milk and oil and mix well again. Ad the chocolate chips/candy pieces and vanilla, and mix again. Pour into a mug. More Valentines for the current Hero challenge. For this first one, I wanted to make a heart to look like a crazy quilt. I used a template that Shari shared with us here. This size will fit into an A2 envelope. For this one, I couldn't wait to see how the Heart Flourish cling stamp would look on a clear card, so that's where this one started. Then I added elements in blue. See my Flickr photostream for details on either card. Do you think there are enough hearts on this? I love hearts and I love pink and Valentine's Day is my holiday! This is a Valentine for the Friendship and Valentine's Challenge on the Hero Club Blog. For details on how this was made see my Flickr photostream. We don't have all that much snow, maybe 8 inches right now, but we are getting a light dusting almost every day, and that helps to keep everything shiny and white, instead of slushy and grey. It's been in the teens for temperatures, and the birds are cleaning out the seed almost as fast as I can get it out there. Sometimes I see as many as 10 cardinals at a time at the feeders, plus blue jays, and the assorted little ones: chickadees, finches, sparrows. There are 2 places in our yard where the cardinals tend to sit together between feedings; I've seen as many as 4 pairs in this miniature crabapple tree. And the males are so brilliant against all the white! More Valentines I'm entering for Hero's Friendship and Valentines challenge. For details see my Flickr photostream. 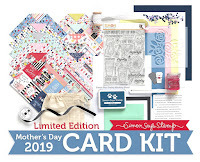 On the Hero Arts Blog this week, Shari has done some Valentine-themed cards, and Tuesday she shared some heart-shaped templates with us. Here is what I've been playing with ever since. Pocket cards are just what they say, a card that, instead of opening the normal way, has a pocket on it, and you can add a note or something else inside that pocket. I made all of these by sewing a zig-zag stitch all along the edges of the pocket to attach it to the backing. For details, see my Flickr photostream. Inspired by the new colors on my blog, details on my Flickr photostream. During the busy holiday season, Hannah awarded me this one. Thank you so much, Hannah, and I'm so sorry that it took me so long to get this posted. And I woke up this morning to find this pretty award from Sally! Thank you, my friend! 1. 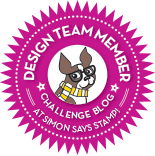 Copy the award to your blog. 2. Link to the person who gave you the award. 3. Identify 7 interesting facts about yourself. 4. Choose 7 other bloggers to pass this award on to. 5. Link to their blogs. 1. I have a degree in mathematics! I can balance the checkbook, usually! 2. Before starting our family, I worked in a law library. 3. I hate brussel sprouts. 4. Due to my DH's job, we lived in Luxembourg for a whole year in 1979......LOVED it, and would like to go back someday soon. It is a small country about the size of Rhode Island, if I remember correctly, situated between Belgium, France and Germany. Beautiful green country. 5. My sisters' nickname for me is Madame Queen......being the oldest, I was (and am) pretty bossy. 6. I love to eat, but hate to cook. When DH retired, he took over that chore. He is so much better at it. 7. Though I now live in another state, I will always be a 'burgher (Pittsburgh, PA) ... friendliest people in the world. 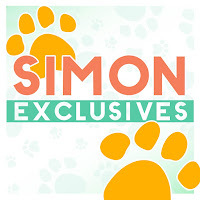 I really like the headers that Suzanne and Sally have made for their blogs, and since it's a bit too early for my usual flower background, I've used their examples and made a still-life picture of some of my favorite things. I am a collector of salt glaze stoneware, teddy bears, and hearts, so I made a grouping on one of my little quilts and added some of my favorite stamps and a card that ties everything together. The only "old" thing here is to the far left: the footed blue glass with cinnamon sticks in it. It always sat on my husband's grandmother's table, filled with spoons. The stoneware represents several potteries, both of them now out of business: the old Beaumont pottery in York, Maine (large pitcher) and a local pottery in Hartville, Ohio, Stebner Pottery (apple butter crock). There is just something about this type of pottery that has always appealed to me, probably because it's usually decorated in blue. Rowe Pottery in Cambridge, Wisconsin is a large company that continues making it. Back when I was making my little doll quilts in the 1980s, I even traded some of them for pottery from Wisconsin Pottery in Columbus, Wisconsin. I'll go back to the flowered background once the snow stops flying! On a side note, who KNEW how much I would enjoy this blogging stuff? I just love tweaking everything! 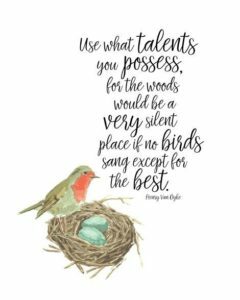 One of the reasons I held off on blogging was that I was afraid I wouldn't have anything to say ..... but it's just the opposite; you can hardly shut me up! Using another new set of stamps from Hero Arts called Two Birds, a cling set with birds and this beautiful spray of roses. 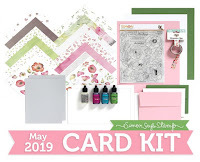 It was stamped over a digital excerpt from Anne of Green Gables, one of my favorite books, coloring in the leaves and stems with colored pencils, and paper-piecing the flowers with peachy-pink cardstock. 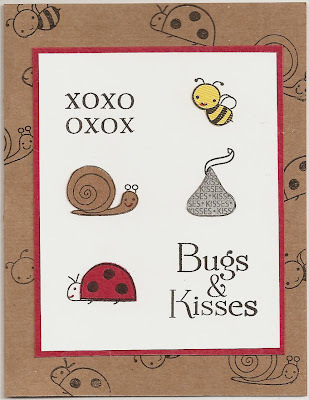 Then I added some digitally-shrunken Heart Winged Butterflies, the sentiment, and a little pink pearl heart. Everything was sponged with Distress Tattered Rose ink. Sue had a good idea to post her favorite cards made previous to the launch of her blog. Since my blog is only 2 months old, I really like her idea of preserving my older favorites here, too. This was so hard, like choosing your favorite child! This one uses three of my very favorite stamps. 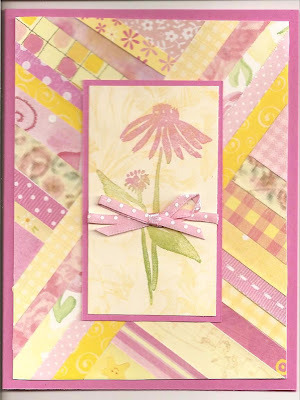 I've included this one because it uses the strip-piecing technique taught to me by Mary Anne, the friend who got me into making cards, and another old favorite stamp, the coneflower. This technique is great for using up little scraps, and also makes me think of quilts, another love of mine. I love autumn. This was for a color challenge. And this was made after Shari Carroll taught us the emboss/resist technique. Lilacs are a sentimental favorite flower of mine. Each little flower was stamped separately in 2 colors of lavender ink. This was inspired by my Hostess sister Sarah's scrapbook page. And if you read yesterday's post, you'll see this is inspired by Marilyn. You'll see Kathy's card in that same post. This one was inspired by Jacqueline. I love birds. This one was made about the time of our grandson's birth. Another of my favorite flowers, the forget-me-not, made by paper-piecing. Clear cards are so fun to make; this one was for my sister's birthday. And just so you know, you CAN teach an old dog new tricks!! This was a card using digital elements. If you haven't noticed yet, I love hearts and flowers. And finally, I made a card for each of my Hero Hostess sisters, using our signature apron colors. If you'd like an up-close and personal look at any of these, just click on the picture. Thanks for indulging me!! Now please keep reading below for my favorites of other cardmakers this year.